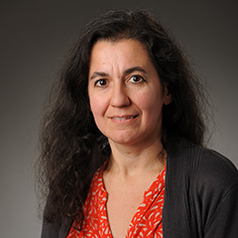 Sophie Mitra, PhD, is Professor in the Department of Economics at Fordham University with research interests in development economics, disability, health and applied microeconomics. She is the author of Disability, Health and Human Development (Palgrave MacMillan, Forthcoming September 2017). Recently, she has studied the economic impact of disability and mental illness, multidimensional poverty, the association between disability and poverty, social protection programs, the definition and prevalence of disability. Some of her research on disability and mental illness is interdisciplinary and mixes qualitative, quantitative and participatory methods. She has published in many peer-reviewed journals including the American Economic Review, Health Economics, Social Science and Medicine, World Development. She has received funding from agencies such as the Economic and Social Research Council, the National Institute of Mental Health and the World Bank. Sophie Mitra is co-editor of the Palgrave Studies in Disability and International Development and is also a fellow of the Human Development and Capability Association and a senior research associate at the Center for International Policy Studies (Fordham).